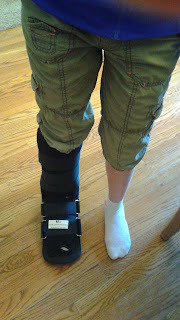 Curly came home from Irish dancing class last Wednesday night and informed Coach and I that her foot hurt. She struggles with tendinitis from time to time, but this was different. Since Coach is a physical therapist, I defer these kinds of complaints to him. I stared at his facial expression from behind the mountain of laundry I was folding. He looked upset. 'She needs to take a break,' he announced. The pain was on the top of her foot. It hurt when she put weight on the ball of her foot. 'Stress fracture?' I asked. He gave me a concerned look, 'Possibly.' She iced her foot before she went to bed. Instead of celebrating that I had sorted and folded several loads of laundry, I felt sick. Coach insisted it was not an emergency. No need to get Curly to the doctor the next day. He suggested that she not dance or play basketball or participate in gym class at school until after she was seen by a doctor. Curly thumping around in a boot until she sees the doctor. I preferred an immediate doctor visit. I wanted answers. If she was going to be stuck in a boot for 6 weeks, I wanted the countdown to begin right away. Coach reassured me that the boot sentence could start immediately since she wasn't doing anything to aggravate the injury. Certain times of the year are intense for an Irish dancer. Back at the Midwest championships over Thanksgiving weekend, Curly placed in the top ten out of around 100 dancers in her age group. That placement qualified her to dance at the National championships. National championships are held annually over fourth of July weekend. This summer they are being held in New Orleans. Curly is a natural Irish dancer. She loves Irish dancing and rarely stands still. Her dancing teacher gives her steps that are typically reserved for the teenage dancers. Curly, 'the rock-star', can handle the difficult steps. When she goes upstairs to take her bath at night, we often yell to her to stop dancing. I often wonder if this will be the day that her non-stop pounding feet will break through the drywall. Last weekend I drove to Milwaukee with the two girls for two days of competitions. Curly placed first both days. Mini placed 5th and 2nd in her two competitions, which include three times the number of competitors that Curly's age group does. Translation: both girls were smiling on the drive home, which made their mother very happy. Their trophy collection is begging for us to add another wing onto the house. If Curly spends 6 weeks in a boot, she will only be left with two weeks to train for Nationals. Mini isn't competing in New Orleans, because she didn't qualify at Midwest championships. Confident Curly assured me that she already knows her steps and she can get ready for Nationals in two weeks. I'm sure she will do her best, but she will most likely not place as high as she would have if she was focusing for the next 8 weeks on fine tuning her steps. In the meantime, my friend invited us to their lake house for July 4th if we opt to not travel to New Orleans that week. I wisely have chosen not to tell my kids about this enticing backup plan. I fear that one of Curly's siblings will break Curly's good leg as insurance that she won't stand a chance of dancing at Nationals.